PLEASE ENQUIRE FOR A DEAL! The all new Toro My Ride is finally in Australia! It features a fully suspended operator platform removing the unwanted lumps and bumps from you ride. Adjustable in seconds to reduce or increase your level of suspension as seen in the video below. This Z-Master Commercial 3000 series mower is powered by a mammoth fuel injected 852cc Kawasaki engine, delivering all the power and high performance you need. 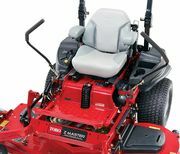 Toro's tough Turbo Force deck is also installed, ensuring that you a purchasing a machine that is built for tough conditions and that is evident through the fully welded thick 7 gauge steel that the deck is constructed from. For more information please call us or download the brochure and watch the video below. Specifications subject to change without notice and without incurring obligation. Products depicted on this sell sheet are for demonstration purposes only. 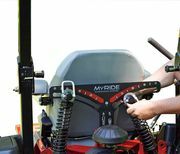 The all new Toro MyRIDE fully suspended operator platform provides the user with ultimate comfort supported by 3 springs with 3.6" travel. 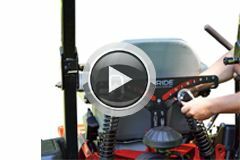 This acts to reduce the feel of bumps, vibrations and rough surfaces as you mow the grass providing a superior ride. This allows the operator to take full control of the MyRIDE settings being able to easily adjust the suspensions softens to best suit their needs. The flexible rubber discharge chute deflects clippings and objects onto the surface spreading it out while protecting others by directing objects into the ground. Its flexibility also means that if you hit something it won't be as an aggressive impact unlike the plastic ones. 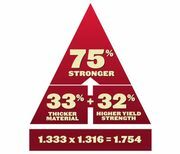 The strong 7-gauge high-strongth steel deck is designed to handle rough conditions and come out on top. Its ability to provide and unbelievable cut while being robust indesign is one of the many reasons Toro is a leading competitor in the market. The huge 1-inch commercial grade spindle assemblies are designed to survive impacts no other spindles in the market can. A stout case iron housing with a massive base and six mounting bolts absorbs the load of impacts and distributes is across a broader area of the deck, meaning it can handle larger impacts and still come out on top. Toro's blades provide an exceptional cut through their innovative design. The high-lift, flex resistant construction with .63 cm thick blades made from heat treated metal provides a more durable and quality product. To the operators right is an easily accessible control panel that also supplies the driver with valuable information about the machine. It provides and digital hour meter, fuel gauge, voltage meter, as well as diagnostic indicators for the safety interlock system.